While watching this movie, I was not enveloped in the story as much as I was wondering why the producers of this film thought it was a good idea. Pet Sematary is adapted from Stephen King's famous 1983 horror novel about a burial ground in the forests of rural Maine with ancient powers of resurrection. This book was already adapted into a film in 1989 directed by Mary Lambert (Clubland, 1999) with a screenplay adapted and written by Stephen King himself. The 2019 remake, directed by a pair of up-and-coming young men (Kevin Kolsch and Dennis Widmyer, Starry Eyes, 2014), is just a strange choice for any movie studio or production team to get behind. The remake has some interesting moments because it differs slightly from the story in the 1989 film, and the remake spends a bit more time exploring the past of our main father and mother characters (Jason Clarke, Chappaquiddick, 2017 and Amy Seimetz, Lean on Pete, 2017) and the grief they carry with them. But it's sadly not enough to make Pet Sematary a fresh or memorable reinterpretation. 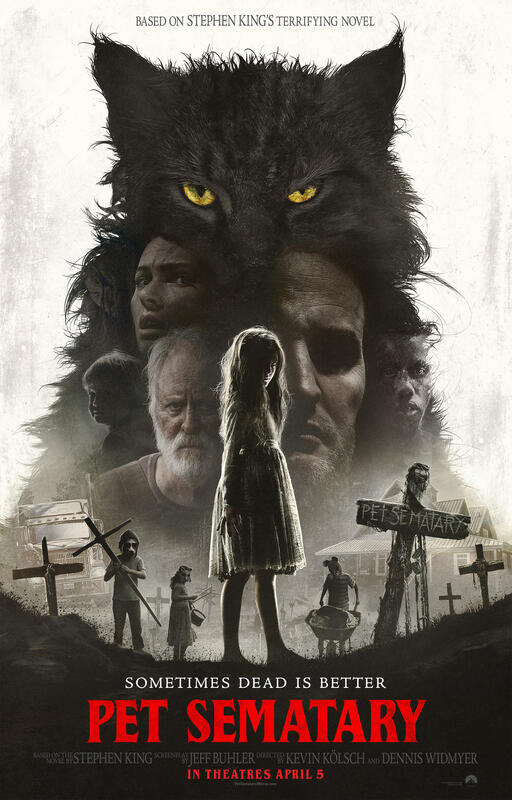 Instead of exploring how people's lives are haunted by remorse or heartache and driven by desperation to reunite with lost love, Pet Sematary does a much better job listing all the expected tropes of a horror film such as flickering light bulbs, whispering ghost voices, darkened doorways, dirty footprints, and a hissing cat. Meow! Did the producers get the idea for this remake from smoking marijuana or swallowing peyote? We will never know. I was so underwhelmed by this film, and I don't understand why this tidal wave of movie remakes seems to keep getting bigger and bigger in Hollywood.